This summer, as the Old Testament Lectionary readings have taken us through the saga of his life, we reach a turning point for King David, when the Prophet Nathan was sent by God to confront David about his sin. Nathan told a story to David about a poor man who had an ewe lamb. The ewe was a pet, eating out of the poor man’s dish, drinking from his cup, growing up with his children, resting in his bosom. A rich man receives a guest to his house and instead of preparing a lamb meal from his own large herd, the rich man takes the ewe lamb from the poor man, butchers it, prepares it, and serves it to his guest. David is outraged at hearing this and declares that the rich man should die. At the very least the rich man should restore to the poor man fourfold what he took from him. Nathan reminded David that God had taken him from his position as a lowly shepherd boy and given him so much—military victories, lands and a kingdom, protection from his enemies, wives and children, and all other manner of success. If all of that had not been enough for David, God would have given more. Do not cast me away from your presence. God forgave David, loved David, cherished David, but there were consequences for David’s sin, for in the sin of desiring Bathsheba, another man’s wife, David unleashed events that involved his whole household and kingdom. The years past and the consequences of David’s sin manifested in tragedies for the entire kingdom. David’s son Amnon violates David’s daughter Tamar. David’s son Absalom seeks revenge for what happened to Tamar, kills Amnon and then flees into exile for three years. David mourns for Amnon, Tamar, and Absalom and the whole situation. David allows Absalom to return, but refuses to embrace him. Absalom takes the throne from his father David. David felt deep and abiding pain. His family was a mess. The kingdom slipped into the hands of his son Absalom. And there was more tragedy to come. David faced war—war against his son, war against his own flesh and blood, war against the one who took the kingdom away. David understood what this meant–that the day could not end well for both David and his son Absalom. David, King David, was deeply conflicted. He must win the battle, fought against the usurper son, for the preservation of the kingdom, but there was deep love for this same son. David knew his son, Absalom—his gifts, his faults, his strengths, his weaknesses, and he still loved him because David, King David, had experienced that same kind of love from God—merciful, life-giving love. This command, from a military leader and a father, came from the depth of David’s love. The leaders heard the command clearly and knew what David was asking. All the people heard what David told the commanders. David must have been in agony that day. He knew the consequences of sin and the mercy of love. He knew the pain that results from choices made with the abuse of power. He knew the devastation of people’s lives that come from such choices. The armies met and with much slaughter and devastation, Absalom’s army was defeated. After the battle, Absalom rode his mule under a tree where his head was caught in the limbs of the oak. He was left hanging between heaven and earth, caught in the balance between life and death and the severity and agony of a king and father. Joab, one of three commanders that David trusted to care for Absalom, encountered a man who told him about Absalom hanging in the tree. Joab took three spears and plunged them into the still living Absalom and then instructed ten armor bearers to surround Absalom and strike and kill him. Then, on this sad day, it came time to tell the king of defeat and victory and death. Two messengers reached David to tell him of the victory, but in both cases, it was not the victory that David was interested in. It was the news of Absalom, his son, that David wanted. The victory was important, but it was the death of his son Absalom that devastated David, that broke his heart. The words that poured forth from David were words of anguish and prayer, of heartbreaking suffering and confession, deep pain and longing for mercy. Do you suppose that God struggles over us as David struggled over Absalom? How many times have we heard God proclaim to us to deal gently with a son or daughter of God? How many times have we been the man or woman, who has seen someone hanging in a tree, suffering, in agony, and not done anything to help get the person down from the tree? We aren’t told why David was so clear in his instruction to deal gently with Absalom, but I think it had something to do with David remembering his own sin and how the forgiveness and grace that God poured over him made a difference in his life. God’s grace and mercy changes us, transforms us into people who seek justice and life for all people. Do you suppose that was what David was hoping for his son Absalom, that his son might also have the chance to feel grace and mercy and be transformed? And what about the trees that we see in the world around us, where people are hanging, barely living, suffering, needing someone to help them down and help them feel love and mercy? What about the trees where we might find ourselves hanging? Recently, I have been hearing those words–deal gently—and I have been wondering what these words mean for my own life. I have been wondering what these words mean for a world that is hurting. I have been wondering how God wants me to deal gently with those that I meet and how dealing gently might be life-giving for someone and maybe even for myself. I cannot imagine what it is like not to having enough to eat. I cannot imagine not having a hot cup of coffee every morning, much less not having the sustenance to keep going. I cannot imagine having a roof over my head or the opportunity to go to work every day. I cannot imagine what it is like to feel in such fear and danger that the only option that I have is to leave everything and everybody that I know in hopes of finding someplace to call home, where I am not afraid, and my children are not afraid. And yet, our world is full of people who are in these situations. In April, while I was on renewal leave, I met a woman, who needed someone to deal gently with her. She was a friend of the Zahra, the refugee woman with whom I stayed during the week I spent with the Peace United Methodist Church in Göppingen, Germany. A second generation, refugee from Afghanistan she had come to Germany from Iran with her daughter. They were living in a refugee camp—an old hotel that was scheduled to be torn down when the last refugee family left. This dear woman invited Zahra and me to dinner. She must have spent all of her food allotment on that one meal, because there were so many different types of the most flavorful food that I have ever eaten, served on a table cloth spread across the floor. I felt horrible eating her food when I knew she was so poor and afraid, but it was important to her that she treated her guests in the traditional manner of hospitality. After we had eaten, the woman told me her story. First, her husband left Iran to go to Germany to seek asylum and to begin a new life. They were to follow quickly. He walked across Turkey, with so many other refugees and secured passage on a raft. Halfway through the journey, the raft sank, and her husband drowned. She was devastated. She was in danger and she had two daughters that needed her to be strong. Her older daughter had kidney disease. Several years before, when life was not so perilous, this woman had given her daughter one of her own kidneys, but in the months after her husband died, her daughter’s kidney failed and there was nothing else that could be done. Her daughter died. Again, she was devastated, but she knew that somehow she had to keep going for her other daughter. So, they left and followed the same route that her husband had taken a few months earlier. They walked across Turkey and made it safely across the ocean and then walked again until they came to Germany, where they were sent to the refugee camp in Göppingen. This woman and her daughter were one of the last three families living in the camp. All three families were stuck there because in order to be settled in a home, certain conditions need to be met, including learning the German language. Each family was in danger of being deported. Each family was living in fear of that deportment. Zahra’s friend had experienced so much trauma in such a short amount of time that it was difficult for her to concentrate in order to learn the language. She was overwhelmed and sad, depressed and in despair and Zahra was concerned that she would never be able to learn the language. When I asked what would happen, Zahra told me that she was determined to be as gentle as she could with her friend and to be right with her helping her learn as much as she could. In other words, Zahra was willing to deal gently with her friend and to offer mercy and hope for as long as it took so that she could learn the language of her new home. Are we Joab, demanding what we think is right despite the command of the king who knows the heart of all humanity? Are we David, who knows the pain of sin but also the peace and transformation that mercy can bring? Are we the one hanging in the trees, in pain? There are people in our lives that need us to deal gently with them. It may even be ourselves. And in dealing gently, we can offer hope and mercy that God can use in offering transformation. Deal gently. Deal gently. Deal gently. Brilliant ! Thank you for linking the story of David with Zahra’s friend. 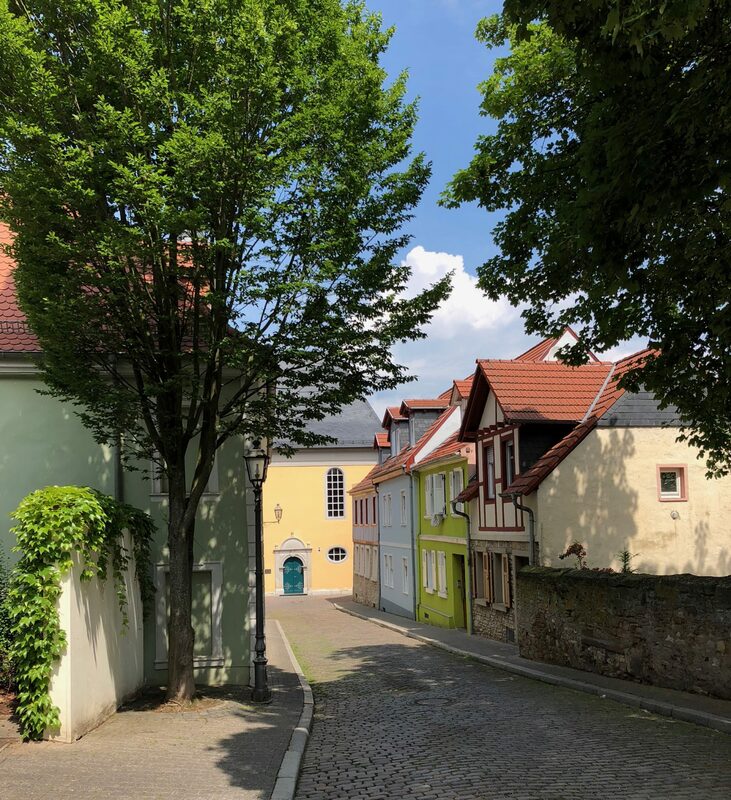 God is really using your experiences in Germany…. and challenging me in many ways. Thank you dear sister .